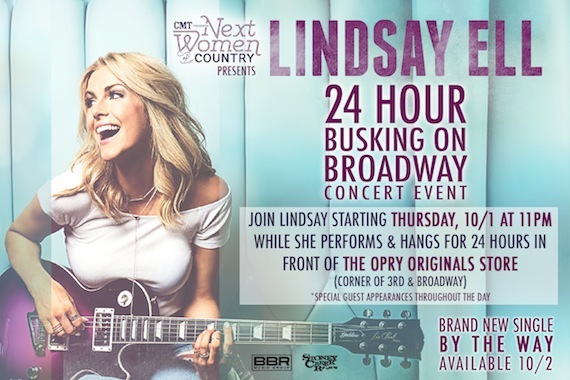 Stoney Creek Records guitar chanteuse Lindsay Ell is kicking off the release of her new single tomorrow night (Oct. 1) with a 24-hour concert on Nashville’s famed Lower Broadway. CMT’s Next Women of Country and Ell have partnered to present the event and raise money for Monroe Carell Jr. Children’s Hospital at Vanderbilt. The event will take place outside the Opry Originals store at 300 Broadway. It starts at 11 p.m. CT on Thursday, Oct. 1, the moment her single “By The Way” hits iTunes. Ell’s 24-hour marathon will include performing, welcoming surprise guests, and visiting with fans until 11 p.m. CT on Friday, Oct. 2. The concert is free and open to the public, and will also be available on Periscope. All tips will be donated to Monroe Carell Jr. Children’s Hospital at Vanderbilt. Additionally, a dedicated link has been established for those who cannot attend in person, but would like to donate here. “By The Way” impacts country radio on Oct. 19.